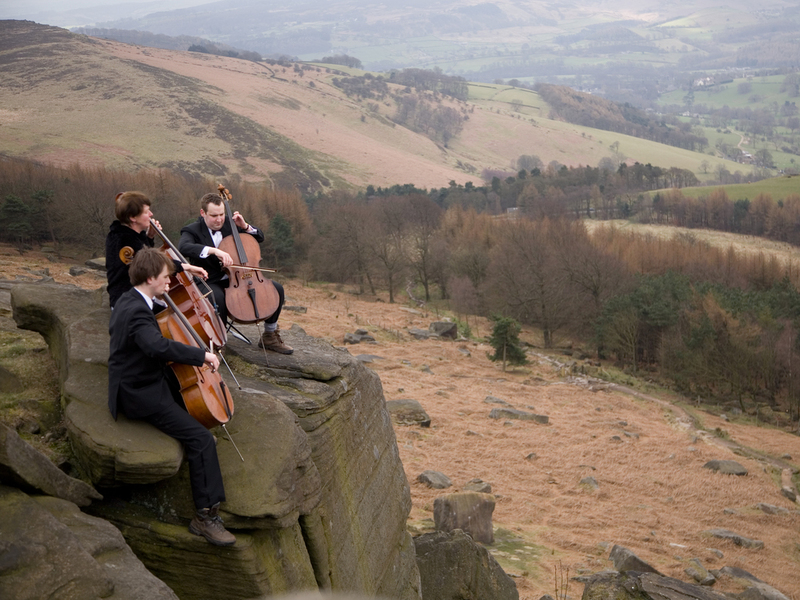 Extreme Cello was born after three cellists from Sheffield - Clare, James and Jeremy - read about, and watched on television, the sport of "Extreme Ironing", in which contestants iron clothes in locations such as up mountains, up trees and under water. They are judged on both the extremity of the location and quality of the ironing. Initially finding the sport bizarre, we then watched a documentary on Channel 4 which focused on the World Championships in Germany. This gave us an idea: if a household task such as ironing can be performed in extreme locations with such panache, why not a creative activity like music making? When the music fund at Westways Primary School in Sheffield was brought to our attention, the result was inevitable - Extreme Cello became a reality. Since the cello is a large instrument, this gives the venture an added complication, but at the same time a far more visual impact. 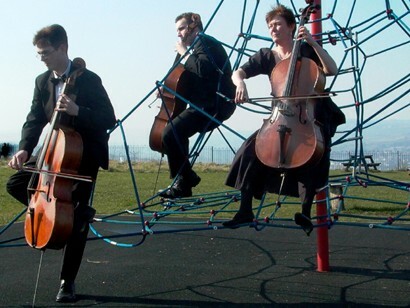 Unlike Extreme Ironing, Extreme Cello is not a competitive sport, but a collaborative experience of musical, visual and physical endeavour. Since 2003, we have climbed buildings, walked long distances, run marathons (well, one marathon), climbed mountains and performed various other exploits with our cellos - giving performances at many unusual places, and often to unsuspecting audiences. All of our previous major ventures are documented in the Previous Challenges section of the site. To raise money for good causes. To date we have raised over £38,000 for a variety of charities, both local and national. To do something a little bit different, and have fun in the process. We're not afraid to appear a little mad - in fact, it's part of our collective identity - and we encourage others to do the same! Clare Wallace has been playing the cello since she was 7. Having been brought up in Gloucester, she went on to study Modern Languages at Kings College, Cambridge. Since then, she has worked in a variety of places, including a spell in Switzerland. Formerly a Music Administrator, she is now music co-ordinator at Sheffield High School. As well as being a cellist, Clare is also a singer. She was a member of the Cambridge Singers, who recorded many critically acclaimed CDs under their conductor John Rutter. She now sings regularly in Sheffield. Clare is also an avid football fan. Although a childhood West Ham United supporter, she has become a keen Sheffield Wednesday fan since living Sheffield. James Rees has been playing the cello since he was 8. Born and bred in Sheffield, he attended Birkdale School before going to study Theology at St John's College, Durham. He subsequently attained an MA in Theology from the same University. In 2004 James married Zoe, and in 2011 they moved to Chester – a metropolis which stole their hearts thanks to the marvel that is Extreme Celling. He is Head of Religious Studies and Philosophy at The King's School, Chester. James is also a singer - with the exception of a four year gap when he was in Durham, and sang in Durham Cathedral Choir, he sang in Sheffield Cathedral Choir from 1989 to 2004, man and boy. He has since sung in the choir at Ely Cathedral and is now a lay clerk at Chester Cathedral. Due to the birthplace and loyalties of his father, James is also a fan of West Ham United. Jeremy Dawson has been playing the cello since he was 11, having realised by then that he was no good at the violin. He was born in Sheffield, but subsequently moved to Leicestershire just prior to his third birthday, and attended Christ's Hospital school in Sussex as a boarder from the age of 11-18. Jeremy also studied at Durham University (St Aidan's College), but his subject was Mathematics. He then did an MSc in Statistics at the University of Sheffield, and subsequently a PhD at Aston University. After spending 12 years commuting from Sheffield to Aston University in Birmingham, Jeremy is now a Professor of Health Management at the University of Sheffield. He also sings in Sheffield Cathedral Choir. Jeremy's football allegiances lie firmly with Sheffield Wednesday. He is also a keen baseball fan, following the Houston Astros from a distance of about 4,500 miles.